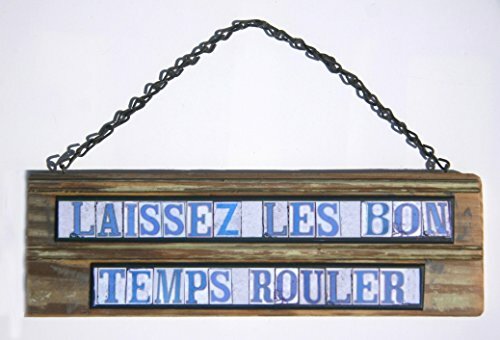 New Orleans Street Tile Sign reading "Laissez les bon temps rouler" - Let the good times roll. Sign pictured is approximately 4" tall by 8" wide and is made from salvage wood and photographic images designed after the old street corner tiles of New Orleans. Images from original street name tiles are used to create wording for this and many other sayings. All signs are finished with various coats of acrylic, and old salvage chain or wire for hanging. Contact shop owner for personalized signs made to order. For other sizes, inquire about custom orders. All sizes are approximate depending on salvage wood availability.